Have all of your percussive tools at the ready, anywhere around your kit. 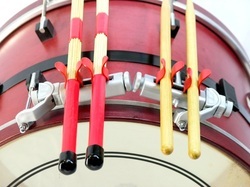 GPI's SticPod™ offers the fastest access to your drumsticks, brushes, mallets, or rods in a compact, low profile design. Place a SticPod™ directly under any tension rod of your snare drum, tom-tom, or floor tom. Rotate the SticPod's™ attachment arm and place it on your bass drum. The red tabs open and close around any size stick. The tension of the tabs can be customized by regulating the tension of a spring with the dial located on the outside of the SticPod™. Finally, the SticPod™ easily folds close to your drum for simple pack up.